Quite simply, the Warrior altered the course of the American Civil War. 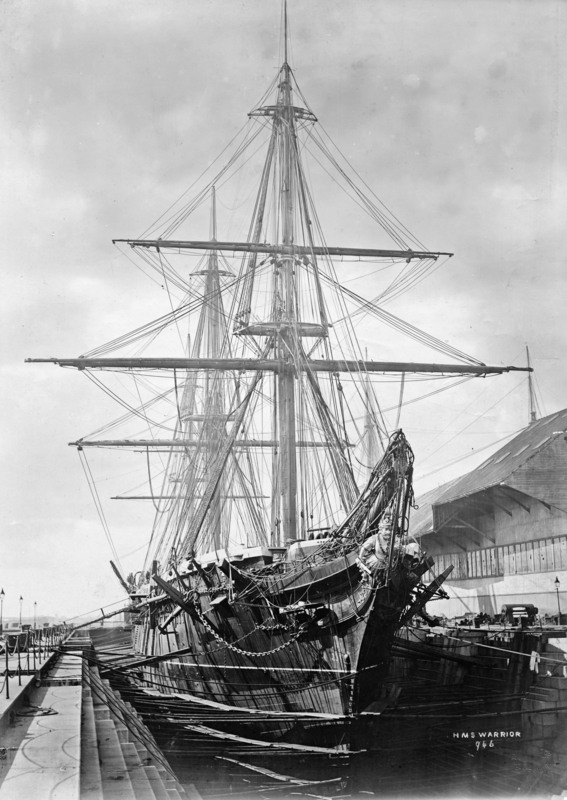 HMS Warrior in drydock during her 1872-1875 refit. NHHC image NH 52524. This isn’t something that’s made its way into the history books—literally thousands of them, more and more, when it comes to the great ‘turning point’ in American (and possibly world) history, as it’s often described. 1 For while the Warrior is still stately and afloat after 150 years, and many across the Atlantic now commemorate the Civil War’s own sesquicentennial, the stories of both, together, have been kept rigidly compartmentalized. There is American history, or there is British history; Civil War or Imperial history; diplomatic or naval history. The lines rarely cross, still. Should we continue to blame the ocean? So how did something which didn’t happen make a decisive impact upon everything else? This is also one of the comparatively unspoken, and difficult, truths of history. Andrew Lambert’s study of H.M.S. Warrior offers the point-blank sobriquet of ‘Victoria’s Ironclad Deterrent’. Here it doesn’t matter the battles actually fought but those prevented—in a rational calculation of opposing strengths and weaknesses as a recurring feature of modern international relations. It’s then left to the historian (American, British, military, political) to reconstruct from a variety of artefacts, clues and sources a complex causal chain of events. It did not take long—if it was not simultaneous—for the dread spectre of British intervention in the American Civil War to assume the shape of HMS Warrior. And if the thought of this one warship, as a national icon of British naval and imperial power, haunted Lincoln’s cabinet (and gave heart to that of Confederate President Jefferson Davis 7 ), it also gave rise to the Union’s great response—in the form of the U.S.S. Monitor. Indeed, it is difficult to see how the Monitor would have been born without the Warrior’s influence. Years before, Swedish-born inventor-engineer John Ericsson had devised his ‘sub-aquatic system of warfare’ for the Allied powers during the Crimean War. Though the Russian navy was largely bottled up before St. Petersburg, neither the British nor French were confident of their ability to overcome the combined defences of Cronstadt, guarding the seaward approach to the enemy capital. Stone forts were still stronger than wooden hulls. Ericsson’s plan called for a specialized steamer, screw-propelled and wholly armoured, with only a shallow raft mounting a revolving iron dome visible above the waterline. Inside this “impregnable globe” would be guns of the heaviest known calibre and capable of inflicting singular knock-out blows. 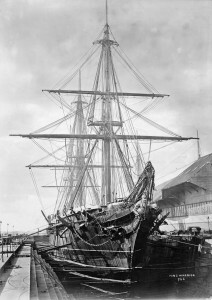 Armed with such a vessel, Ericsson suggested to Emperor Napoleon III, gauntlets could be run with relative safety, and “A fleet at anchor might be fired and put in a sinking condition before enabled to get under way.” Alas for steam blockships—and “for the ‘wooden walls that formerly ruled the waves!’ ” 8 The French, however, bombarded with a stream of plans (some more ill-informed than others) of how to decisively ‘win the war in a single day’, kept the idea of iron armour plating and steam propulsion generally and rejected John Ericsson specifically. Under the guidance of their own Ministry of Marine, shallow-drafted ‘batteries’ were constructed which could deliver a conventional broadside at fairly close quarters against shore fortifications. At the very least these might suppress counter-fire while a general bombardment rattled the defenders and troop landings took them from the rear. Iron might thus neutralize granite. At Kinburn (17 October, 1855) the results were remarkable; the French armoured batteries took amazing punishment yet performed well. 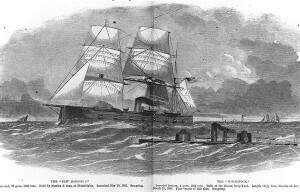 Britain was building iron batteries of her own, along with a whole new Brown Water flotilla of gunboats and mortar vessels which suddenly shifted the seat of war back to the Baltic, even as Sevastopol finally fell to the bitter Allied siege in the Crimea. Ericsson accordingly tucked his proposal away and returned to other ventures. On 29 August, 1861 he was drafting a letter to President Lincoln ‘offering his services’. Now the goal was rooting out Confederate warships guarded by land batteries—particularly the captured remains of the steam-frigate Merrimack at Norfolk, Virginia, which the rebels were known to be converting into a formidable iron-plated monster. Ericsson sought “no emolument of any kind”; he was rich enough on various engine patents and seems to have been caught up in the patriotic tide sweeping the North after the humiliating defeat at 1st Bull Run (21 July, 1861). He was also canny enough to mention in closing the “now well-established fact that steel clad vessels” could not be stopped by forts, and that New York City was “quite at the mercy of such intruders, and may at any moment be laid in ruins…” If Britain or France ever did challenge the Union blockade and enter the war, Ericsson reminded Lincoln, only his weapons-system held the key to “crushing the sides” of their ironclads “regardless of Armstrong guns” 9 . USS Monitor general plan published in 1862, showing the ship’s inboard profile, plan view below the upper deck and hull cross sections through the engine and boiler spaces. NHHC image NH 50954. If this extraordinary man-of-war was first approved and contracted for in the two-tone shadow of a threat, one Confederate and the other European, then it was certainly in the harsh light of the Trent Affair—within a fortnight of her keel being laid—that she actually found a name. Nothing roused Britannia’s ire more than the brazen capture of two Southern emissaries aboard the British packet steamer by a Yankee cruiser, on 8 November, 1861. Anglo-American tensions were already at the breaking point since the Civil War began; the blockade, the Queen’s Neutrality, the highly protectionist Morrill Tariff, and the apparently open-ended duration of the conflict itself had sparked an increasingly acrimonious press war with Columbia even harsher than that of Northand South. Both English-speaking halves of the mid-Victorian era accused the other of arrogance and ignorance and both were probably right. The iron-clad intruder will thus prove a severe monitor to those leaders. But there are other leaders who will also be startled and admonished by the booming of the guns from the impregnable iron turret: “Downing Street” will hardly view with indifference this last “Yankee notion,” this monitor. To the Lords of the Admiralty the new craft will be a monitor, suggesting doubts as to the propriety of completing those four steel ships at three and a half million apiece. Here too, the history books tend to overlook the role the British Warrior played in not only making the American Monitor but popularising that whole class of warship until it nearly lost the war for the Northern states. 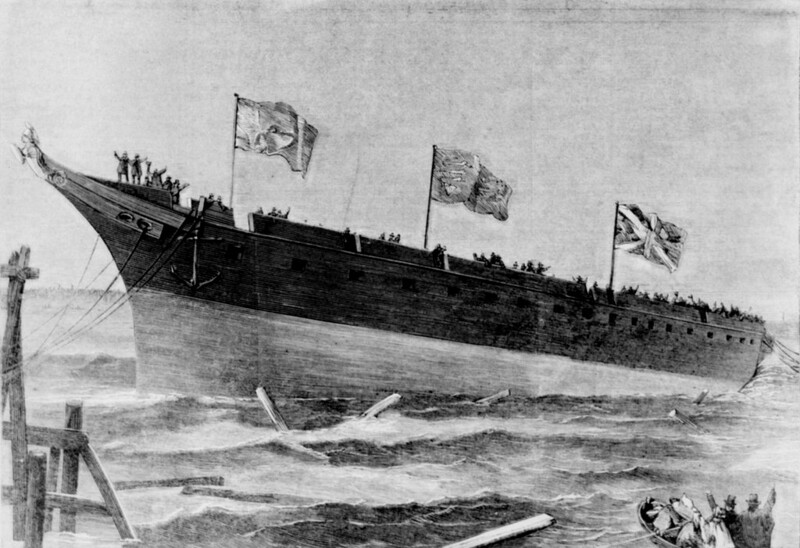 In his seminal 1933 work, The Introduction of the Ironclad Warship, James Baxter traces the overriding influence of Ericsson’s original ‘Monitor’ prototype in the fateful, decision-making days between August and December, 1861—three months before that warship duelled the Confederate Virginia (the Merrimack) to a standstill at Hampton Roads, Virginia (9 March, 1862). Not only did the U.S. Navy Department—and Gustavus Fox in particular—prefer traditional ocean-going frigates on the general plan of Britain’s Warrior, if not the French Gloire, but the Bureau of Ship Construction & Repair had its own scheme of a multi-‘cupola’ vessel in the works. Both ideas, however, required solid 4½-inch armour plating which had to be largely manufactured abroad and imported. Had the Trent Crisis not occurred during this interval, the Union’s ironclad navy during the Civil War might very well have had a different face, with a different outcome to the entire conflict. The Northern press, as could be expected, took no end of pleasure from this reaction to the Monitor overseas. Scientific American reversed its previous insistence upon ocean-going Warriors and declared the Monitor more of the new ideal. “Practical men” in America saw revolving gun turrets “applied to any war vessel, no matter how large or fast she may be”; while “the designers and constructors of iron-clad vessels in England have committed a great mistake in building their frigates with too great a draft of water.” Harper’s Weekly depicted the Monitor literally lecturing foreign powers how to build proper ironclad warships, showing up Johnny Bull in the proverbial contest of toy boats on ponds, and forcing the British Lion to change its tune over possible intervention. 18 It seemed, in those golden days and weeks following her debut, that anything indeed was possible. In fact, the Monitor was capable of achieving very little—especially against forts. On 15 May, 1862, she attempted to force her way up the James River and place the Confederate capital of Richmond under her guns. A handful of cannon on the river bluffs, offering plunging fire, combined with obstructions blocking the river, were enough to drive off the Monitor, and leave her companion ironclad—Bushnell’s Galena—riddled with holes and casualties. Yet despite her commanding officer’s misgivings, Fox insisted that the newer monitors, in sufficient numbers, might smash their way into even the most heavily-guarded ports of the South. Hotbeds of rebel defiance, namely Charleston, South Carolina, would then be left with the stark choice of surrender or bombardment. This might have worked, had not the Confederates recognised that mines (or ‘torpedoes’) combined with forts and obstructions, were often enough to out-scare the enemy in his terrible new engines-of-war. Even Ericsson had his doubts; he had never promised an iron ship which could out-gun a stone fort—or even an earthwork. Turret ships might deliver 15-inch guns through gauntlets and sink any enemy warship, armoured or not, which they encountered. But they were just as susceptible to underwater threats as the Warrior, and much more prone to sinking like a stone if actually damaged, having little reserve buoyancy. 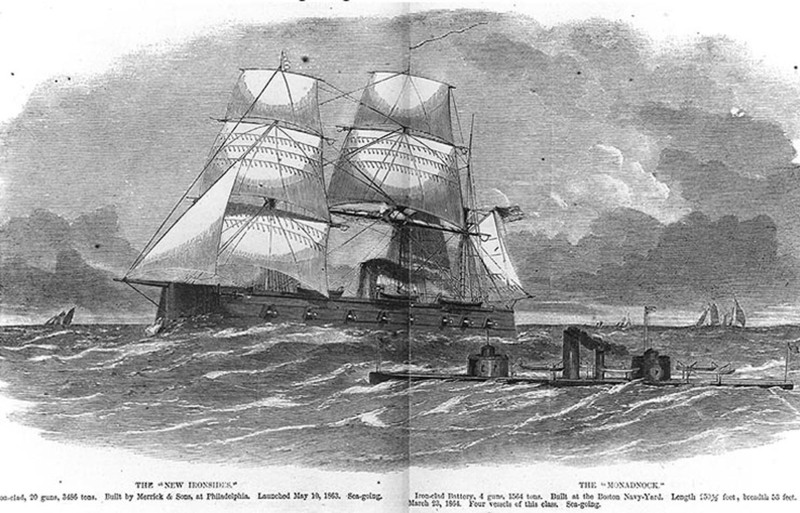 USS New Ironsides (left) and USS Monadnock (1864-1874) (right foreground) Engraving published in “Harper’s Weekly”, 3 February 1866 as part of a larger print entitled “The Iron-clad Navy of the United States. Text printed below the image is in error concerning the date of New Ironsides’ launch, which actually took place on 10 May 1862. NHHC image NH 61431. The Civil War, however, continued anyway. The Union’s historic response to the Warrior was indeed the Monitor, a weapons-platform concept far in advance of her contemporaries, including the idea of the man-of-war as nearly self-automated ‘machine’. For their part, British naval authorities were intrigued by the idea, but never fully sold. By the beginning of 1865, the Controller of the Navy, Rear Admiral Robert Spencer Robinson, warned Somerset and Sir Frederick Grey, the First Sea Lord, that “The Northern States would suffer little material injury by hostilities with Great Britain”, and that “very little damage it is apprehended could be done by Great Britain to the coastal towns of America by hostile operations. They are well defended now by land fortifications and the war with the South has called into existence a large fleet of vessels adapted for purposes of defence.” 25 On the other hand, American ironclads could hardly threaten the British Isles directly, though the menace to British interests on the North American and West Indian Station was serious. This effectively pulled the rug out from under much of Britain’s offensive-deterrence stance; protecting the land frontier of Canada by threatening the eastern seaboard of the United States. 26 Ironically enough, however, the outbreak of civil war in America so completely consumed much of the attention of the White House, that Seward’s wild suggestion of invading Canada as a desperate means of uniting North and South was quickly dismissed by Lincoln, while the merest hint of aggression—offered more by the British press than British foreign policy—was likewise enough to keep the Warrior safely anchored in Portsmouth, not off the approaches to New York City. So completely obsessed was the mid-Victorian generation with ‘inventions’—with technology and ‘wonder weapons’—that ironclad revolutions like the Warrior or the Monitor were much more about their potency as floating symbols of propaganda and prestige. The real truths were much harder to capture and convey in contemporary newsprint, trans-Atlantic rumours and a myriad of semi-professional ‘opinions’. The real source of Warrior’s power was, after all, in everything that went into her construction, and everything that kept her fully operational, year-round, the world-over if need be. Thus, within a week of Robinson’s dour prognostication above, a first-hand, detailed report by U.S. Navy Chief Engineer J. W. King on the “dock yards and iron works of Great Britain and France” was so crushing that Welles ordered no less than a 1,000 copies of it to be printed for circulation to members of Congress. 27 “We have neither such dock-yards as are to be found in England and France, nor such a collection of iron ship building yards as there is in Great Britain; the combined capabilities of all the iron yards within our limits not being equal to the first of the great iron ship building yards on the river Thames.” 28 If America truly wanted to forge ahead as a leading maritime and naval power, it would take advantage of the brief yet crucial respite which the monitors had gained for the Union while it was at war with itself and commence a first-class government shipyard (in the manner of Chatham by 1865) at League Island, Philadelphia for the manufacture and maintenance of a Blue-Water Iron Navy. This didn’t happen until 1871, and American pre-eminence wasn’t firmly established until the Second World War finally called forth history’s greatest mobilisation of human and natural resources; a process above and beyond the creation of any fearful—yet ephemeral—war-winning ‘silver bullets’. This entry was posted in Article and tagged article, Civil War, Confederate, Fuller, history, HMS, IJNH, international, ironclad, journal, naval, navy, royal, Union, Warrior. Bookmark the permalink.